Paver installation is quick because the units have to be installed on a bed of compacted sand. While this may seem simple, the fact is that the job is best handled by professional paver installers. They will ensure that the ground is leveled properly and that the sand is compacted well. They will then install the pavers methodically and make sure that the joints are sanded and the surfaces sealed; this increases the resilience and longevity of the installation. Paver installation should always be handled by professionals with experience. They will survey the area where the pavers need to be installed and will take detailed measurements. The installers will then spread sand and compact it well. The paver units will then be installed in the design approved by the client. In some cases, the joints may be sanded and the surfaces could be sealed as well. Pavers are very commonly used materials in landscaping projects. These units could be made of concrete, natural stone or brick and are extremely versatile; they can be used in various areas of the landscape. If you want a surface that’s resilient and long-lasting, you would have to ensure that the professionals you hire for the job are experienced and have the skills and licensing to handle the job. Brick paving looks great in almost any type of setting. Today, you have the option to choose from brick pavers of different shapes, sizes, colors, designs, and styles. Skilled designers will provide you all the information you need about these units and how the installation is done. 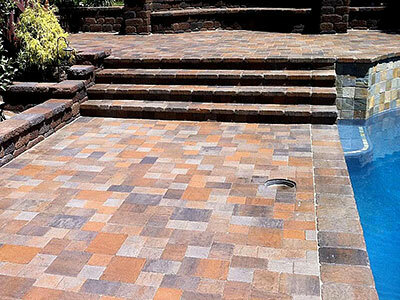 An experienced company will also ensure that skilled paver installers are deployed on the job. When you are hiring any landscape company to handle paver installation for you, check whether the installers have the experience and so the skill to handle your job to perfection. The installers will take detailed measurements; ensure that the sand base is compacted well and that the work is completed within the stipulated timeframe. They will also make sure that the edging is installed well as these features help hold the paver units in place. If you are planning on getting any paver installation work done on your property, you want to make sure that the company you hire would be able to provide excellent, customized solutions and this is where local companies such as LR Landscaping & Pavers come in. They will provide you excellent solutions, at a very competitive paver installation cost.